Deveining and peeling prawns can be a messy business, so here is the most efficient way to get those crustaceans ready for the pan. 1. 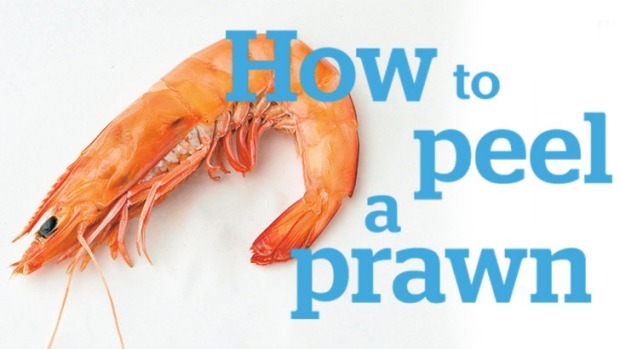 Remove head from prawn with a slight twisting motion. 2. Peel shells and legs from body of prawn, leaving tails intact. 3. Lay prawn flat on its side and make an incision down its back. 4. Using the tip of your knife scrape away the dark "vein" and any innards. 5. Prawns are now butterflied, ready for stir-frying or steaming; butterflied prawns cook more quickly and evenly. Now try Kylie Kwong's prawns with sweet and salty garlic sauce or Adam Liaw's garlic butter prawns.